I had been staring at the triangular wooden ceiling of our A-Frame cabin for nearly 20 minutes, listening to the wind howl and willing the pressure in my bladder to ease off so I could steal just a little more rest. This would be my last night sharing a room with only my husband for a little while. 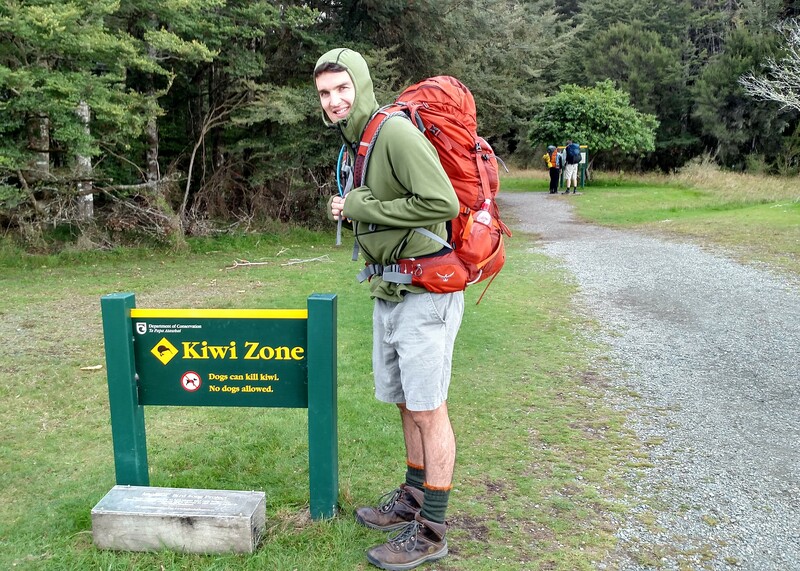 We were set to head off on the Kepler Track – one of New Zealand’s incredible great walks – in just a few hours’ time. 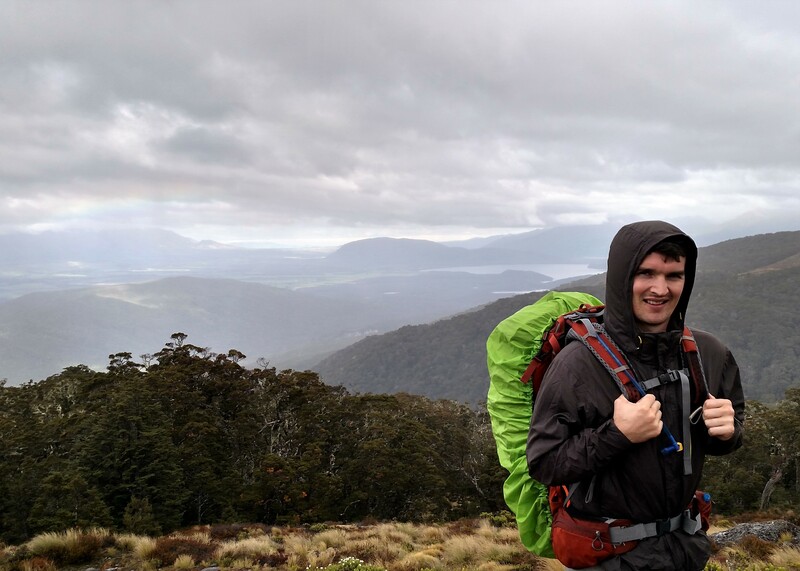 And while we carried our tents on our last great walk on the Abel Tasman, this time we would be spending our nights in the huts, sleeping in dormitories of dozens. We were in the Fiordlands now, and the scene could not have been more different than the white sand beaches of the Abel Tasman. The weather was much harsher in this southern corner of the southern island, and the topography a lot more extreme. 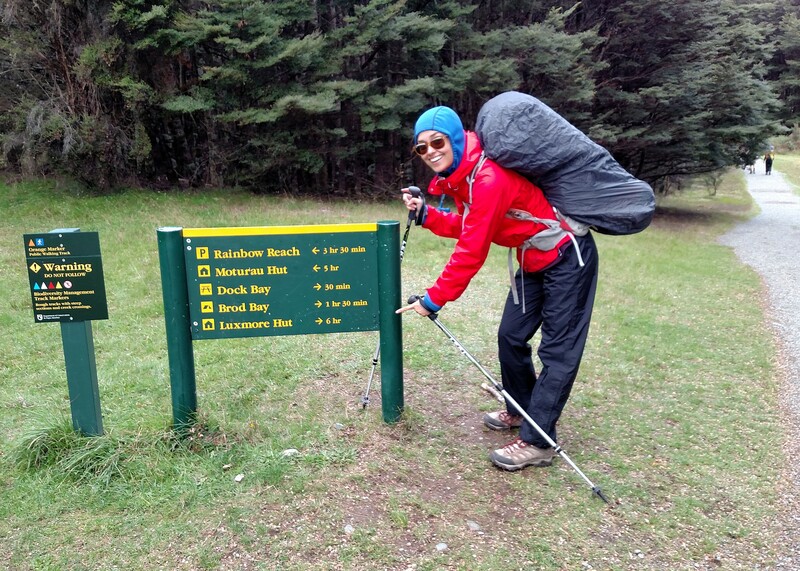 Our walk was to take us along steep mountain ridges unsuitable for camping – hence the huts. And so here I was, treasuring what very well might be my last snorer-less sleep for a few nights. Besides, it was a long, dark walk to the toilets. And if the howl of the wind was any indication, it did not sound warm outside. Tom turned on his back next to me. I could just make out the silhouette of his eyelashes in the dark room as they fluttered open. “I have to pee,” I whispered to him. Our little cabin did not include a toilet. In the name of budget, we often stay in campgrounds with communal restrooms. I don’t mind, except for when I have to go during the night or early morning. While I hate to admit it, I’ve lived enough of life to be weary of the experience of being a woman wondering around alone in the dark. Tom’s familiar with this sensibility of mine. Ever the gentleman, he leaned over and grabbed his jacket without complaint. 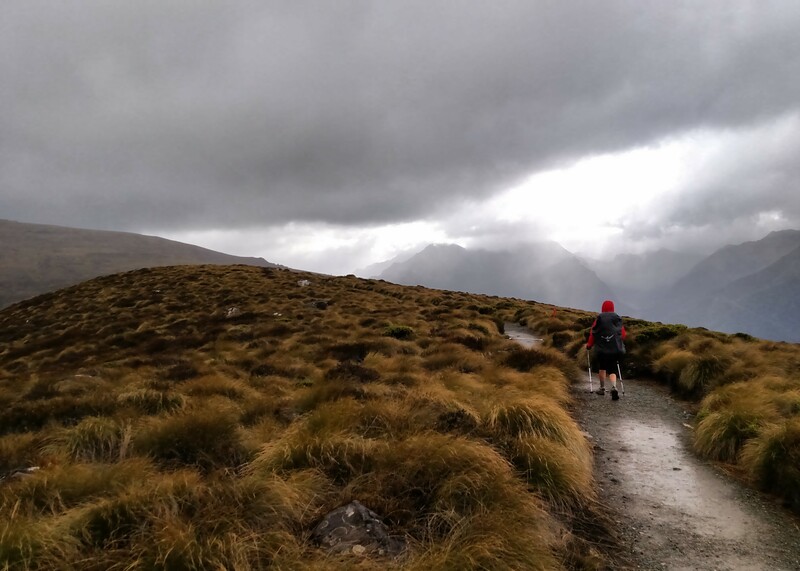 “It’s going to rain on your alpine crossing,” the ranger was telling us, as she checked us in at the Fiordlands National Park Visitor Center. “Nope, not great weather tomorrow. Winds forecasted to be around 80 kilometers per hour.” Our group of four – Tom, his brother Jacob, Jacob’s partner Ursula, and I listened carefully. “Is that okay?” I asked, tentatively. I didn’t want to cancel our trip, but I also didn’t want to get blown off the side of the mountain. It made me nervous. But Kiwis are some of the most laid-back people on the planet, and maybe their influence on my life was starting to rub off. I reasoned to myself that we might as well head off and enjoy the day’s hike. Worst comes to worst we would just have to come back the way we came tomorrow and cut the walk short, instead of crossing the alpine route to our second night’s hut. Yes, that was definitely the worst that could possibly happen… right? I pushed a vision of myself doing gusty somersaults off the side of a cliff to the back of my mind, back to the black from which it had appeared so vividly. Feigning confidence I took my seat in the car for our last little drive to the trailhead. The parking lot was frigid. 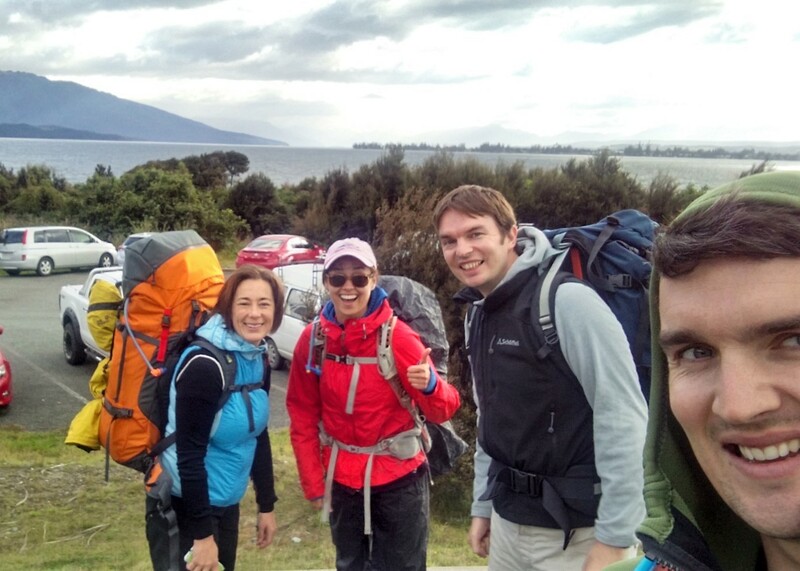 The first part of the walk follows the beautiful shoreline of Lake Te Anau. But in the capark that morning, without the cover of trees, the wind was coming straight off the lake, pummeling us with freezing slaps. I immediately donned all the cold and wet weather gear I had. Neither of the boys had brought long pants. Ursula and I questioned that decision one last time as the brothers shrugged it off. 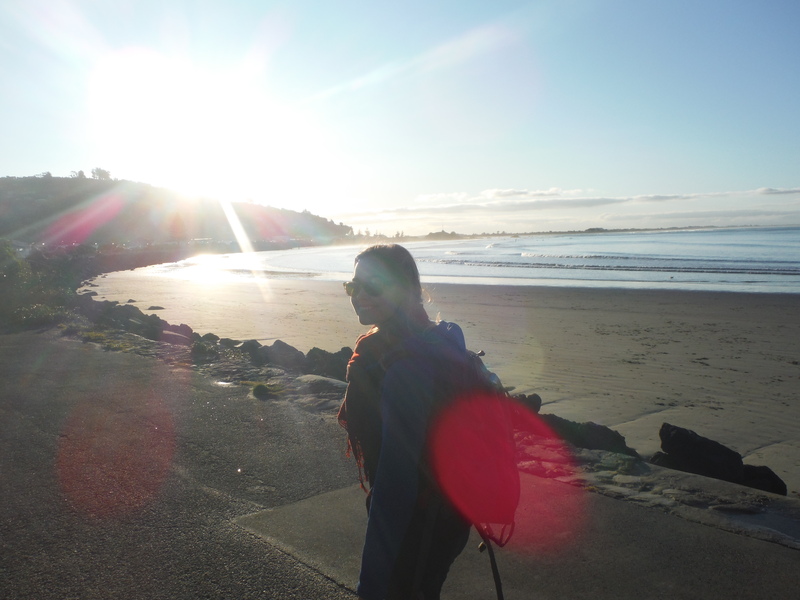 And so our walk began. I was utterly shocked. No one had ever given me a compliment like that on a trail. “Give me your camera, you have to let me take your picture for you,” she continued. Awkwardly, we obliged. I passed her my cell phone and showed her how to use it, then slid my arm around Tom’s waist and smiled. I mean, what do you do when a white-haired lady appears out of nowhere and demands a photoshoot? You do whatever she says, apparently. “Now kiss! Kiss for the camera!” she instructed. We were not good models, but we tried, and it turns out she was no skilled photographer. All of the photos came out blurry, but I actually feel that that makes them even more perfect. They really capture the sort of random, joyful energy of the moment. The climb began around halfway through the hike. The Luxmore hut – home for the night – was above the tree line – so most of the elevation change would be covered that day. The trail rises about 750m (2,460 ft) over the course of a little more than 8 kilometers. Tom and I were ready for the slog, but we were surprised to find that the trail didn’t feel as steep as the sharp incline on our information pamphlets implied. The majority of the altitude gain was covered in wonderfully maintained, comfortably graded switchbacks under the happy cover of a lush temperate rainforest. Don’t get me wrong – our heart rates were up. But we expected way worse. 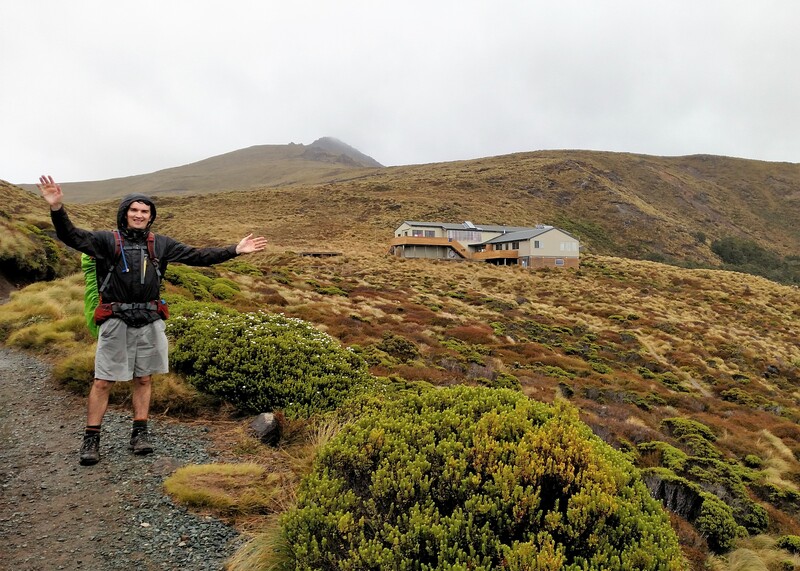 The highlight of our day was when we finally reached the tree-line, where the forest dropped away suddenly to reveal the gentle, grass covered mountaintops and 360 degree views of the fiordlands and farming below. The next day’s forecasted weather had already started to move in by that time, but we didn’t mind the wind and rain in our faces. The fast moving clouds made for spectacular views. And in amongst it all, perched on the side of the mountain, was Luxmore Hut – with it’s miracle bunks and flush toilets and warm fire. Sitting on a sunny bench inside, sheltered from the wind but not the views, I stopped worrying about tomorrow’s forecast. A night up here was well worth the walk, and if we’d have to return the way we came the next morning, so be it. I honestly couldn’t tell you if anyone in our dorm snored that night. I was sleeping too deeply, dreaming of blue lakes and green rainforests and fast-moving clouds framing sunbeams that shone like spotlights along mountaintops. Beautiful pictures. And the story about the white-haired lady…Magical.